1st issue in 1949-1951: the outer jacket is paper sleeve type, with gold printing “Reeves-Fairchild Margin Control” label (take a look at the 2nd issue of MG-25012 to see the difference). This label looks strange - the “Deep Groove” is not on the label paper, while I can feel the deep groove itself on the disc under the label. It is possible that this disc was pressed without the label - then a staff noticed the fact and glued the label on the disc. Mr. 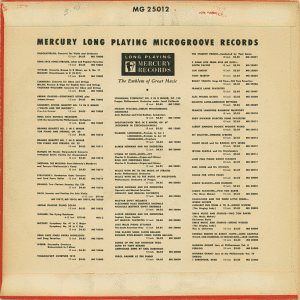 Boogie Woogie's compilation (on 10-inch LP) from several 78rpms on Mercury recorded in his very last career (late 1940s). 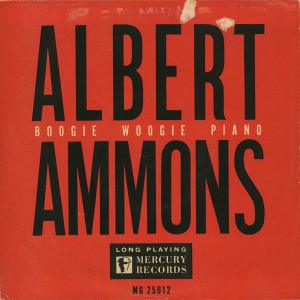 The famous Boogie-Woogie pianist Albert Ammons recorded a sort of sessions in his last years. Some of them are accompanied with the tenor giant Gene Ammons. Unfortunately, orerall impression of the tunes which are collected on this 10-inch LP is, that this may not be his best sessions. This may because he plays many ordinary popular tunes. Görgen Antonsson-san kindly taught me this recoding information from recent CD re-issues. Thank you! I have double-checked with his information and the Ruppli's info, in order to adopt the correct information which is much possible. Albert Ammons (p), Ike Perkins (g), Israel Crosby (b), Jack Cooley (ds). 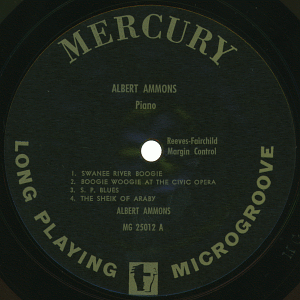 Recorded at WGN Studios, Chicago, IL on November 12, 1946. 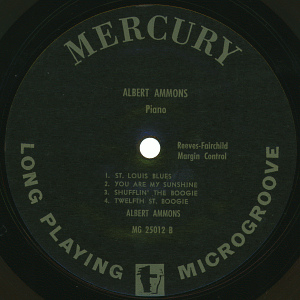 Recorded in Chicago, IL on August 6, 1947.
same personnel/place/date as A-3, plus Marvin Randolf (tp). Albert Ammons (p), Ike Perkins (g), Israel Crosby (b), unknown (ds). Recorded in Chicago IL, late 1947.
visitors to this page since January 24, 2004.